An Anglo Indian table cabinet. A nineteenth century Anglo Indian table cabinet. Inlaid with rosewood, walnut, boxwood, tortoiseshell and ivory, having twin brass carrying handles and a fall front to reveal a bank of eight drawers. 38cm wide. A Mintons majolica casserole dish. A rare Mintons majolica oval casserole dish and cover of rockwork form and moulded to depict mallard ducks being stalked by a pair of foxes. With moulded toadstool finial and further ornamented with moulded ivy leaves. Impressed marks. 37cm wide. A Tiffany & Co diamond ring. A Tiffany & Co diamond and platinum engagement ring. Set with a round brilliant cut diamond 1.01 ct, VS2, colour F. Surrounded by eighteen brilliant cut diamonds, twelve square cut diamonds to the shoulders and further set under the bezel with round and square cut diamonds. Sold with original box and GIA report. Ring size K. 4.79 grams. Antoine Barye bronze, Taureau Debout. A nineteenth century French bronze sculpture of a bull on stepped plinth after Antoine Louis Barye, cast by Barbedienne. Taureau Debout (standing bull) in Verdi Gris patina. Signed Barye, stamped F. B. and inscribed F. Barbedienne, Fondeur. 28cm long. Georgian bracket clock Thomas Wagstaffe. A George III bracket clock by Thomas Wagstaffe of London. With bronze mounted figured mahogany pagoda case with reeded canted corners, twin loop handles over fish scale arch brass fretwork panels and raised on bracket feet. Housing an eight day triple fusee movement with engraved back plate, verge escapement, pull repeater, and quarter striking on nine bells. Having enamel dial with Roman and Arabic markers signed Thos. Wagstaffe, London and with a subsidiary strike/silent dial both reserved on an arch topped gilded brass mask ornamented with scrollwork spandrels. 47cm high, 36cm wide, 22cm deep. Thomas Wagstaff is recorded in Britten's Old Clocks and Watches working at 33 Gracechurch Street 1766-94. John Stinton Royal Worcester urn. A Royal Worcester pot pourri urn and cover by John Stinton. With pierced neck supporting ribbon swags and with loop handles. Lavishly gilded and finely enamelled with three highland cattle watering with a cottage in the distance. Signed, printed puce mark with date code for 1931, shape number 1428. 30 cm high, 22 cm wide. An antique ivory tusk hunting horn. The mouthpiece issues from a wild boars mouth, the main body is elaborately carved with a boar hunting scene over a frieze with a boar and deer on scrollwork bands then with a Royal coat of arms and commemorative roundel portrait plaque of King George I dated 1714, 57cm. A late nineteenth / early twentieth century French kingwood bombe shaped vitrine with ormolu mounts including classical busts and Rococo scrolls, decorated to the base with five Vernis Martin panels and raised on scrolling feet, 2m 15cm. An art deco burr maple credenza. Cross banded in rosewood, with four carved giltwood pilasters and raised on spade supports. 150cm wide, 41cm deep, 102cm high. A George III parliament clock. A fine George III eight day "Act of Parliament" wall clock in figured mahogany case by Thomas Lindall. Having carved scalloped pediment and tole work square hood fringed with gardrooned moulding framing the circular silvered dial. With centre seconds, Arabic and Roman markers and signed Thos Lindall, 140cm high. A pair of Royal Worcester urns. A pair of Royal Worcester twin handled pedestal urns painted by Terrence Nutt & Paul Stanley with apples, peaches, grapes and blackberries. With moulded scrolling handles, gadrooning and gilded. Printed black marks shape 1969. 30.5cm. A very fine Regency olive wood kneehole desk, probably by Wright and Mansfield. With gilt metal quarter moulds and beads, drop handles and raised on bun feet, locks stamped Bramah & Co Nottingham, one drawer stamped 104 Bond Street. 1m 48cm wide, 63cm deep, 72cm high. Kneehole 58cm high and 54cm wide. A Chippendale period mahogany secretaire library bookcase. With open triangular pediment over a stylized leaf moulded frieze. With moulded panelled doors, fitted interior and raised on plain bracket feet. 256cm high, 126cm wide, 60cm deep. A George III glass goblet. A George III large glass goblet and cover. Raised on a double knop airtwist stem and wheel engraved with English garden flowers. Later diamond point engraved inscription T. E. Walton 1833, 37cm high, 27cm high without cover. Bowl diamater 13cm, foot diameter 13.25cm. A Royal Worcester urn by C. Baldwyn. A Royal Worcester twin handled pedestal urn and cover by Charles Baldwyn. The handles moulded with mask terminals are gilded and edged in orange enamel and flank the main body ground in matt pale blue decorated with four swans in flight. Signed C. H. C. Baldwyn, printed green mark, shape number 1575, date code for 1903, 26cm high. A pair of Chinese jade birds. A pair of twentieth century Chinese mottled pale jade models of birds of prey. With carved feathers and raised on hardwood stands formed as tree roots, 10cm. A Chelsea tea plant beaker. A Chelsea triangle period moulded tea plant beaker. With waved rim edge in brown enamel, with vivid enamelling outlined in black to the spiral moulded plants over a fluted ground. Unmarked, c1745-50, 7cm. John Freeman Royal Worcester urn. A large Royal Worcester twin handled pedestal vase and cover by John Freeman. Richly gilded, with moulded lion and dolphin masks and finely enamelled to the globular body in the round with peaches, grapes and apples. Signed, printed black mark, shape number 1691. 36 cm high. A Royal Worcester urn by J. Stinton. A large Royal Worcester ovoid pot pourri jar by John Stinton. With pierced cover having pointed finial, inner knopped cover and painted to the main body with a pair of highland cattle watering over an ozier moulded lower body. Signed John Stinton, printed puce mark, shape number 1286, date code for 1912, 30cm high. David Bowkett Royal Worcester urns. A pair of Royal Worcester twin handled campana vases by David R Bowkett. Gilded, with beaded rims, moulded leaves to the socle and enamelled with apples, peaches and berries. Signed, printed green mark and date code for 1967. Shape number 2157, 22 cm high. A rare Chelsea hexagonal high shouldered tea jar. Enamelled in the Kakiemon style with the two quail pattern under a fretwork and flower head border, c1750-55. Unmarked, unglazed flat base, 13 cm high. Cheetham collection label. A Regency mahogany wine cooler. A fine Regency figured mahogany wine cooler in the manner of Thomas Hope. Of sarcophagus form, having carved lion mask to each of the canted corners with ormolu lion mask handles, ebonized mouldings and raised on sturdy carved lion paw feet, interior lined, 86 cm wide. A Chelsea fable painted teabowl. A Chelsea fable decorated octagonal teabowl painted by J. H. O'Neale. With an extensive landscape with a recumbent lion clutching a mouse in its paws with a further two rodents scurrying away. Stilt marks, c1750-52, 8.5cm. Stanley Royle R.B.A. 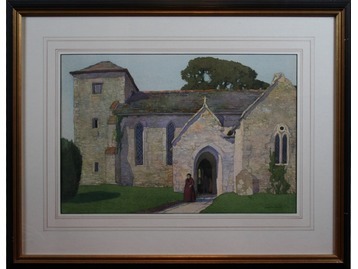 (1888-1961) Watercolour in parcel gilt and ebonized frame. Sunday Morning Church, Knowle St Peter, Dorset 1936. Signed and dated. 38 cm x 56 cm. A Chinese bronze incense burner. A Chinese bronze temple incense burner formed as a Kylin, with hinged head and of stout proportions, 28cm high. A Chelsea raised anchor teabowl. A Chelsea raised anchor period octagonal teabowl. Decorated in the Kakiemon style after Meissen with a pair of dragons and precious objects. Raised anchor on a pad mark, c1750-2, 8.5cm wide. Exhibition label for the ceramics and glass circle of Australia 1994 No.8. A George III longcase clock by Jeremiah Standring of Bolton, Lancashire. The brass arch topped dial incorporates a moon roller, silvered chapter ring, subsidiary seconds, date aperture and is inscribed "Time flies pursue it man. For why? Thy days are but a span. The four pillar eight day movement with anchor escapement chimes hourly on a bell. The figured mahognay case with pagoda and swan neck hood is adorned with maple panels, fluted column supports and blind fret carving. The trunk with broad door is flanked by a pair of quarter columns over a stepped base supported on ogee bracket feet. 260cm tall. 233cm to the swan neck. Hood 24cm deep, 51cm wide. Base 26cm deep 54cm wide. Pair of Victorian novelty silver cruets. A pair of Victorian cast silver novelty salt and pepper shakers by Alexander Crichton, formed as a pair of toads poised and with glass inset eyes, assayed London 1881, 163 grams, 6 cm. A Chelsea teabowl and saucer. A Chelsea teabowl and saucer. Finely potted and painted with exotic birds in landscapes under brown line rims. Painted red anchor marks and stilt marks, c1755 saucer 12.5cm diameter. A Georgian yellow metal mourning pendant in fitted leather mounted case. Finely painted with an ivory portrait miniature of a woman, with guilloche enamel and lock of hair verso. 8cm. A Queen Anne walking cane. A Queen Anne malacca walking cane with pique work turned ivory grip, with a hole for a wrist loop, silver collar and later silver tip, 85cm long. A pair of Indian ivory figures. A pair of early nineteenth century Indian carved ivory figures with polychrome decoration, Maharaja and companion in Mughal dress, raised on canted rectangular plinths. 18cm high. A William IV figured mahogany and brass inlaid drop dial wall clock. With double fusee eight day movement striking horly on a bell. Having painted convex dial with serpent hands, Roman markers and signed Frodsham, Gracechurch St, London. 63cm long dial 25cm diameter. A nineteenth century boulle work bracket clock. Adorned with gilt metal mounts, having enamel and gilt brass dial and housing a twin train eight day movement with anchor escapement, silk suspension pendulum and chiming half hourly on a bell. 78cm high. A Chelsea raised anchor beaker. A Chelsea raised anchor period octagonal beaker. Decorated in the Kakiemon style with the lady and the Pavilion pattern. Raised anchor mark on an oval pad, c1750-52, 7cm high. A George III silver tankard London 1769. A George III silver tankard of tapering cylindrical form by William & James Priest. With domed hinged cover, acanthus thumbpiece and double scrolling handle with heart shaped terminal. Engraved cypher to the upper handle OAW. Assayed London 1769. 19cm high, 914 grams. A William IV Country House sideboard. A William IV figured mahogany sideboard of Country House proportions. With a large central celleret drawer having shell moulded handle, adorned with carved mantling and flanked by a pair of tapering column front supports and with pilasters to the rear. 220cm wide, 66cm deep, 101cm high. A Chinese stem bowl of lotus petal form. Raised on a tightly fluted stem and painted in underglaze blue with lozenge panels containing dragons. With double line borders and six character Xuande mark to the well of the bowl, probably eighteenth century, 16cm diameter. A Regency mahogany library cabinet. Raised on splay bracket supports and with a pair of glazed doors fitted with dummy leather book spines opening to reveal three shelves, 149cm high. A Victorian fine quality burr maple pier cabinet. With ebony stringing, cross banding and ebonized mouldings. Having quarter round flanks and with pilaster supports. 93cm high, 96cm wide, 36cm deep. Medieval period carved oak plaque. A group of four medieval period carved oak allegorical figure plaques emblematic of harvest and in later mount. Each plaque 57cm x 18cm. An antique Tibetan bronze and iron phurbu. With pommel formed as four masks and with triangular blade issuing from the mouth of a mythical beast. 28cm. A Victorian yellow metal necklace in fitted case. Formed as a dragon clutching a serpent in its mouth and set with foil backed cabochon garnets. With scale formed links and engraved with further scale texture and scrolls. 46cm, gross weight 24.6 grams. A Victorian 18 carat gold hunter watch. A Victorian 18 carat gold cased hunter fob watch. Decorated with cobalt blue enamel bands and set with rose cut diamonds in five floriform settings. Works engraved for the Am Watch Co. Assayed Birmingham 1883, 6cm. 80 grams. An antique Japanese matchlock musket with octagonal barrel terminating with a tulip shaped muzzle. With hardwood full stock and ornamented with engraved brass and silver mounts. Barrel 103cm. Along with a modern fitted case. A Chinese pale jade figure. A twentieth century Chinese carved pale jade figure of a seated Buddha raised on a hardwood plinth. With detailed incised hair and wearing a long robe sat cross legged, 14cm. A twentieth century Chinese vase. With turquoise ground neck enamelled with flowers decorated to the main body with a carnival scene. Jiaqing seal mark, 33 cm. A pair of Chippendale period chairs. A pair of Chippendale period mahogany French type upholstered armchairs. With carved scrolling arms and supports. James Salt (1850-1903) oil on canvas. James Salt (1850-1903). Oil on canvas in pierced gilt frame. The Grand Canal, Venice. Signed, 34cm x 60cm. A Regency mahogany longcase clock. A Regency mahogany longcase clock with pagoda hood, banded and with fluted column supports with gilt metal Corinthian capitals. The main trunk is flanked by a pair of quarter columns again with gilt metal capitals and oval inlaid arch top door. With brass arch top dial having subsidiary seconds and silvered chapter ring with Roman numeral markers, housing an eight day movement chiming hourly on a bell, 2m 30cm. A Victorian walnut bonheur du jour. A Victorian figured walnut bonheur du jour. Having marquetry inlay and ormolu mounts. With a central arch topped mirror flanked by a pair of cupboards over a fitted bureau section raised on square scroll supports, 140cm high. A George III silver bowl by Paul Storr. A George III silver pedestal rose bowl by Paul Storr. Chased with husk swags supported on ribbons. Assayed London 1800. 21.5cm diameter, 595 grams. A George V silver and silver inlaid tortoiseshell table clock. With scrolling carry handle, enamel dial signed Edward, Glasgow and raised on squat bun feet. Housing a thirty hour movement with platform escapement and chiming on a gong. 21cm high. A Chelsea fable painted saucer. A restored Chelsea octagonal saucer with fable scene painted by J. H. O'Neale 'The young kite and his mother' Depicting the sick bird laying in a nest with his mother perched nearby on a branch within an extensive landscape under a double red ring border, with further scattered sprigs and the rim edge in brown enamel. Unmarked, c1755, 13.5cm wide. Along with the eighteenth century source engraving J. Kirk Fecit. White gold, emerald & diamond pendant. An 18 carat white gold pear shaped pendant. Set with a large ovoid emerald on a pave diamond ground. Emerald approx 14 ct M2, diamonds approx 2.45 ct VS2-SI1 G-H. 21.26 grams, 3.5cm. A Martin Brothers stoneware vase. A Martin Brothers stoneware vase. Of slender ovoid form and with four elongated handles. Glazed in mottled pale blue and moulded in relief with fish, crabs, jellyfish and a snake together with an underwater scene. Incised marks 9-1909 Martin Bros London & Southall. 26 cm high. A pair of Antique Chinese Chippendale style mahogany hall chairs. Each with carved scrollwork top rails over trellis back supports. With embroidered upholstery and raised on plain square supports. Full height 100cm, seat height 46cm, front seat width 58cm. A pair of twentieth century life size bronze figures of Manchu servants. Modelled in the form of knelt palanquin carriers. Each dressed in a loin cloth and with queue hair styles. 92 cm high. A nineteenth century Italian giltwood and polychrome figural occasional table. Formed as a female crouching Blackamoor holding aloft a cloth draped table top and raised on a circular plinth with three paw feet. 76cm high. Frederick William Scarbrough (1860-1939). Small framed watercolour, pool of London with boats and ships, signed, 17cm x 26cm. An early nineteenth century French gilt bronze and porcelain mantel clock, probably Sèvres. Of ovoid form and ground in gros bleu. Surmounted with an urn of flowers, flanked by twin ram masks and supported on scrolling corbels and a socle united by a flower garland and raised over a breakfront plinth. With enamel dial signed W. C. Shaw, Paris and with Roman and Arabic markers. Housing an eight day movement with anchor escapement and chiming half hourly on a bell. 56cm high. Base 28cm x 18cm. A Chinese celadon jade boulder. A Chinese large carved celadon jade boulder on fitted hardwood stand. Decorated in relief with a mountain city with pine trees and a pair of scholars conversing on a bridge. Un carved to the reverse and with russet suffusions, 28cm total height, 14cm wide, jade weighs 2678 grams. Circle of William Wissing (1653-1687). Circle of William Wissing (1653-1687). Gilt framed oil on canvas. Portrait of a gentleman in an oval cartouche, 72cm x 63cm. A Meissen pierced cabinet plate. A fine nineteenth century Meissen cabinet plate. With wide pierced border moulded with trellis and gilded, ground in gros bleau and with a central cartouche enamelled with a Watteauesque scene with a courting shepherd boy and companion. Underglaze crossed swords mark. 26 cm diameter. A Beswick horse and rider. A Beswick model of a huntsman on rearing horse model 868.